The White Mage Saga is never going to be my favorite series and it's probably not going to be the first book I recommend to anyone, but then I'm a bit old for the series and not it's target audiance. Still it is a good, solid well told story and I have every intention of reading the next books in the series whether that means listening to audio books or for those that don't yet have them reading them with my own eyes. 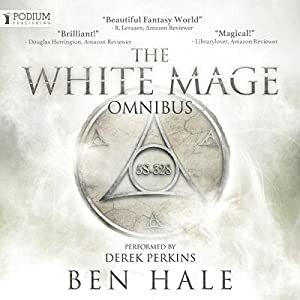 I got the first three of the books of this series on audible as the White Mage Omnibus. About thirty hours of good storytelling for one credit. It is well read and in the style I prefer with small adjustments on characters inflections but without someone actually doing voices. Once you get down to the story it seems a bit familiar because it is. The story is of a fifteen year old girl who discovers she has magic and has to go to a school for mages to learn to use her magic. She is of course the chosen one who must unite the magical and non magical world and of course fight a great evil. While this sounds like Harry Potter specifically and every young adult fiction story in the last fifteen years it has its own personality. It also avoids many of the pitfalls of this type of story. It starts by not making the fifteen year old girl in the story seem stupid, flighty or boy crazy. She has important things to do and while she wants to have friends and has to deal with them that isn't the center of the story. Another thing that help with this is that the time that passes in the story is considerably compacted compared to something like Harry Potter. Each of the books takes place over about three months rather than a year. This gives the characters less time to adjust to everything and because the threat is always imminent there is far fewer lulls. I am also fond of it addressing some of the issues with having a world of magic hidden from the average human. This isn't just the way it is or even a good thing, it's the result of things that have happened and something that needs to be dealt with. There are a few things that I didn't love about the stories though many of them are nitpicks or personal preference. From time to time it would go on tangents that while important followed characters that you knew little or nothing about but would become important later. This isn't ideal though it is understandable and doesn't happen much. Another of the minor nitpicks was that the books end on cliffhangers. This is a personal pet peeve of mine. I understand the thought process that you want to make people excited to read the next book, but in my opinion a novel, even a novel in a series, should feel like a complete section of the story. Have your cliffhangers between chapters and feel free to have threads between books that need to be resolved. The problem is that in most cases the cliffhangers in most books feel contrived and aren't even really suspenseful. You're not going to have the next book start with your main character dead. The world isn't going to be blown up in a nuclear Armageddon three books into your seven book series. Those minor issues, as well as a couple of characters that I never really connected to were very minor though and in general I would say that if you're looking for another young adult fantasy series to read that this is a good choice and a far better choice than many books that are far better known. So ignore the teenage vampire books, turn away from the half gods and read about the last Oracle.